With the new, expanded three-day conference format, there are more opportunities to present! MATSOL encourages engaging, interactive presentations that make the theory to practice connection. Successful proposals include practical classroom activities informed by current research and pedagogy, demonstrations of successful instructional practices, examinations of current issues in education, and research that informs educators in the Massachusetts context. Presentations should engage the audience through hands-on or interactive activities when possible. Find out more by reading the Call for Proposals and watching a recording of the webinar Creating a Successful Conference Proposal. An introduction of the national Seal of Biliteracy movement and an overview of the Massachusetts Seal of Biliteracy Pilot Project, including the updated resources and experience gained from the third year of the pilot. Presented by the Language Opportunity Coalition. 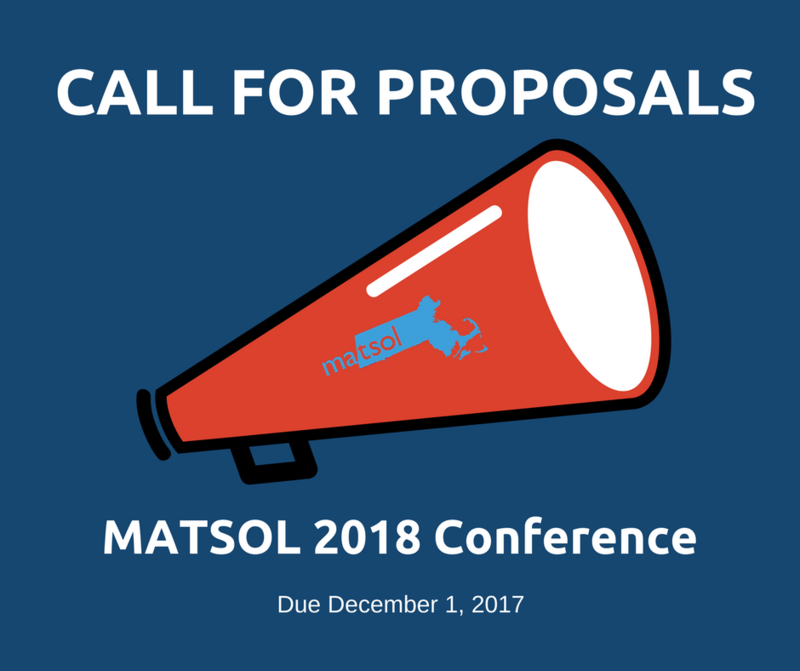 Learn about submitting a proposal for the MATSOL 2018 Conference. Topics: Conference Overview; Identify Topic & Audience; Prepare your proposal; Submit your proposal & Tips for presenting. Be sure to also download and read the Call for Proposals on the MATSOL 2018 Conference webpage! Ending TPS would force parents from Central America and Haiti to choose between taking their children into dangerous conditions, or splitting up their families. See this TPS fact sheet for information. Email or tweet here: https://buff.ly/2yjSq9e or use AFSC's tool to call your Representative's office: (844) 817-8056. One of MIRA Coalition’s top priorities this session is to pass a bill to set up a commission to address barriers to licensure for health care professionals, so they be deployed in high-need areas. More. Join the Student Immigrant Movement to celebrate a year of defiance in the face of Trump, and welcome SIM's new leadership to the staff! $50 per person. November 10 from 6:00-10:00 PM in East Boston. Tickets available at bit.ly/sim2017celebration. Faculty from the Center for Holocaust and Genocide Studies and ReImagining Migration Project will lead a day-long educational workshop on the effects of immigration on world events, visions of diversity and inclusion, and our legal system. The workshop will explore the challenges faced by different groups of immigrants, including Catholics, Jews, Latinx, Muslims, and Dreamers. During the day, educators will be introduced to primary sources and digital and traditional teaching techniques.